In 1998, Gabrielino High School’s Screamin’ Eagles Speech and Debate Team won their first Southern California Debate League championship. This year, the team remains the reigning champion as they claimed the title again at the State Qualifying tournament at California State University of Long Beach on March 3. The tournament had three regular rounds, one semifinal, and one final. Each round began almost immediately after the previous, leaving no time for rest before students had to rush to the next room in order to perform their speeches once again. With this tournament designated as the last in the league, students felt the pressure to perform well in order to qualify for the State Championship competition held in April. For those who did not qualify, this tournament was the last time that they would ever perform the same speech again. Co-Captain Angelina Liang, senior, proved Raymundo’s words to be true when she placed third in Expository Speaking. Both Liang and Raymundo are four-year Speech and Debate members and will be moving on to the State Championships. The Screamin’ Eagles competed against 18 teams with over 300 students in the district. With seven finalists in 14 events, only the top four or five in each category were able to qualify for State. Out of the 22 students from Gabrielino that entered the final rounds, 20 were able to qualify for State. These students will join the eight students that automatically qualified for State by placing first or second in both the Fall Varsity and Spring Varsity tournaments at the State Championships. Gabrielino also scored 229 sweepstakes points, marking this year as their 21st league championship win. 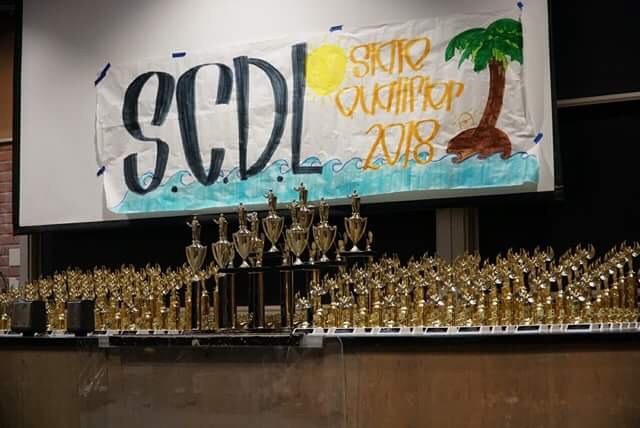 The Gabrielino Screamin’ Eagles Speech and Debate team won their 21st consecutive Southern California Debate League championship this year.